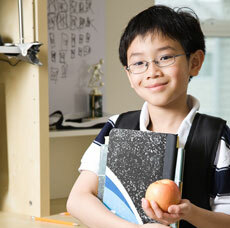 Tip: Smart nutrition is the most important school supply your child needs for a successful academic year. As a parent, you strive to provide your children with the best opportunities for success, but one of the most fundamental factors influencing your child’s ability to thrive is often overlooked – nutrition. The right nutrition enables your child to stay focused and engaged throughout the long school day, supports their immune system to minimize absences, helps their bodies and brains develop to their full potential, and helps moderate their moods to support a classroom environment that is conducive to learning. As you prepare your children for the coming school year, prioritize smart nutrition to fuel them for learning and excellence. Every meal of the day is important for growing bodies, but research consistently shows that a nourishing breakfast has the power to significantly improve academic performance. Eating breakfast daily is associated with higher IQ, test scores and measures of attention, concentration and memory. Skipping breakfast is linked to decreased cognitive performance, meaning your child has a harder time paying attention and retaining information. Not in the habit of eating breakfast? Start with several days a week and increase over time – the more days per week children eat breakfast, the larger the improvement in academic performance. Any breakfast is better than no breakfast – but not all breakfasts are created equal. That bowl of cereal is convenient, but many varieties contain processed carbohydrates and added sugars that put your child on an energy rollercoaster, leaving them fatigued and struggling to focus by mid-morning. A meal containing whole grains, protein and healthy fats provides sustained energy that leads to greater academic performance. Our Cardamom-Ginger Quinoa Bowl is a quick, uniquely delicious breakfast that is high in protein, fiber and healthy fats – all of which sustain your child’s energy so they stay attentive all day. Fruits and vegetables provide an array of nutrients, including vitamins A, B6, B12, folate, and calcium, which support health and mental acuity, and are especially important for growing bodies. Research indicates that children who eat more fruits and vegetables are more likely to have higher grades and fewer absences due to illness. Provide your children with a rainbow of fruits and vegetables to ensure they get the nutrients they need to do their academic best. Added sugar is the enemy of academic success. Beyond zapping your child’s energy and ability to focus, eating too much added sugar over time may actually impair their memory and ability to learn. Soda is the number one source of added sugar in children’s diets, followed by fruit drinks. Students who consume fewer sugar-sweetened beverages, including sports drinks and juice drinks, tend to have higher test scores and better academic performance overall. Encourage your children to drink water, sparkling water or other unsweetened beverages to help them stay energized, feel their best and be better learners. As you prepare for back-to-school this month, make a renewed commitment to smart nutrition to ensure that your children are well equipped for success at school. A nourishing diet that includes a power-packed breakfast, a wide variety of fruits and vegetables, and minimal added sugars fuels your children for success and helps them reach their fullest potential.